Everyone has a select number of photos which they prefer over others. This is one of mine. I love it so much that I had it enlarged, matted and framed. It’s now hanging over the head of my bed. While at Alaska’s Katmai National Park in 2007, we saw a large number of brown bears while slowly riding and drifting in a Zodiac inflatable boat, with six of us on board plus our guide. 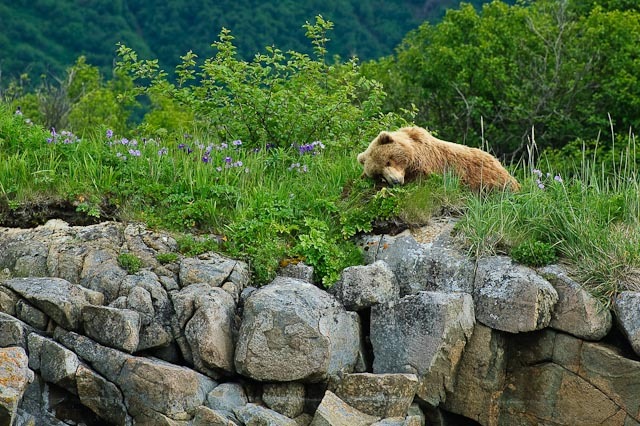 As we rounded a portion of a small cove, we spotted this bear taking a nap on some large rock outcrops. After we returned home and I processed the image, he became my “sleeping bear” and thus his position of honor now framed above my bed. I absolutely love the scenery in this image—the large boulders, the flowers and the greenery, with the far background slightly out of focus. To say I was lucky to get this shot would be an understatement. At the time, I was so excited I could hardly think straight. Thankfully, I remembered how to work my Nikon camera!